Cemeteries: Cemeteries are where families bury their relatives and place stones to honor and remember their lives. Mass Burial Sites: Mass Burial Sites are where Jews were marched into the woods and murdered in groups and dumped into a trench. We have photographs of the Jewish Cemetery in Rezekne taken by Dave Howard when he visited in 2003. We also have the wonderful photos taken by Christine Usdin in 2009 when she photographed over 100 tombstones and provided translations. Visit her original site or view the photos on this site. As former residents of Rezekne arrived in the United States in the early part of the 20th century those living in the New York City area formed a burial association. Judy Simon has kindly provided us with copies of the charter documents, photos of the leadership, copies of the constitution, and her own personal photos of some of the tombstones at the actual burial site. Thanks to Judy Simon again you can visit a portion of the Cemetery in New York and view many of the tombstones there. Click on the photo below for a visit. who died at the barbarian fascist hands in the year 1941." 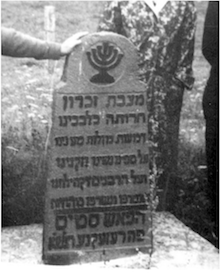 During July 1941 the Germans and local policemen took groups of Jewish men who were incarcerated in the prison to the Jewish cemetery, where they were shot. On August 3, 1941 the Jewish women, children, and old people who had remained in the town were also imprisoned. On the next day the Germans began taking them in groups from the prison to the Jewish cemetery. Over a period of ten days, under guard by local policemen, they were taken on foot or by truck to the cemetery, where they were forced to undress and then shot. 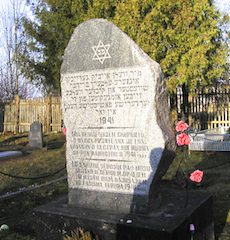 Approximately 2,000 Jews, a majority of Rēzekne's Jews, were killed in the cemetery. In April 1944 the Germans opened the mass-grave and burned all the bodies. The Monument below is at the Mass Murder site at the Jewish Cemetery. We mourn, and with tears from our eyes, the engraved in our hearts our children, women, and adults and the Rabbis of our congregation that were preyed upon and burned by the Fascist animals here In REZEKNE, Latvia. International Association of Jewish Genealogical Societies also has a report on Rezekne. You will have to search their site for the report on Rezekne. If you have difficulty navigating their site you can download a pdf version of their page on Rezekne by clicking here.